In today’s technology-driven world, most of us spend hours of our day sitting at a desk. Whether we’re working eight hours a day at the office or spending hours on social media websites, the average person can spend upwards of one-third of their day sitting at a computer desk. Evolution didn’t design the human body for excessive sitting, and it shows in the complications that arise because of this sedentary lifestyle. Lower back pain is the most common ailment, but frequent computer users will also end up with leg pain, ankle pain and even weight gain due to too much sitting. In fact, even wrist and elbow pain is common among computer users because their office chair isn’t an equal height to their desk. While many computer users have just resigned themselves to this suffering, there is a way to escape it and still use your computer comfortably for hours on end. 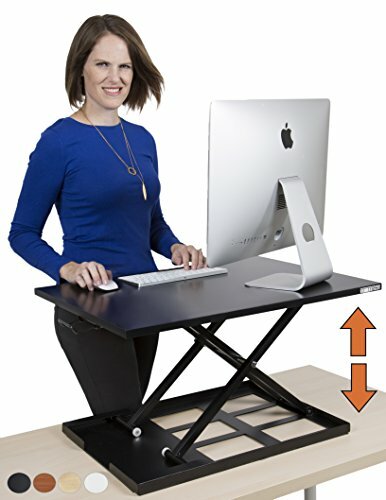 The standing desk is a revolutionary new way to use your computer and stay healthy at the same time. A standing desk is exactly what it sounds like: a desk that you stand to use. These desks typically come up to your chest and allow you to stand while you work. The most typical application of a standing desk is to use it with computers; however, you can use one with anything you typically use a desk for, such as drawing. Standing desks use the same materials that regular desks use, with many of them created from wood. In many cases, the only real difference between a standing desk and a regular desk is the size of the legs. Who Are Standing Desks For? Standing desks are a good choice for anyone who finds themselves sitting in an office chair at a desk for an extended period. 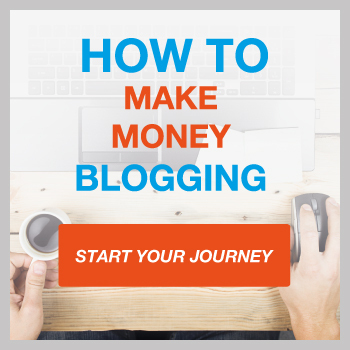 For example, a Web designer, graphic designers, bloggers or freelance writer who spends eight hours a day or more working will find themselves benefiting a lot from a standing desk. Many offices, which routinely have employees working eight hours a day or more at their desks, can also find it beneficial to switch to a standing desk. Within days of making the switch, you’ll find yourself with less lower back pain and more energy. Also there’s great health benefits to the user when monitors are positioned at the correct eye-level, especially if you’re using your monitor for editing photos or building websites which require you to look at them for long periods of time. Think of it this way: Between eight hours sitting at a desk and eight hours sleeping, that’s two-thirds of the day you are sedentary. A standing desk will go a long way towards restoring the health of your joints. If you’re interested in a healthier, less sedentary lifestyle balanced around your job’s long hours, then a standing desk is an ideal choice for you. However, this isn’t to say that standing desks are only useful for career-minded individuals, as home users can find a lot of use for them as well. If you’re a gamer who spends hours in front of his monitor with the hottest new game, you may want to consider switching to a standing desk. Even infrequent computer users will love a standing desk for the convenience it provides. Instead of sitting down, adjusting your chair and repositioning the monitor just to check your email quickly, you can simply just walk over to your computer, check your messages and then leave. If you’ve read this far, you now have all the knowledge necessary to buy a standing desk. However, you’ll quickly realize there are hundreds, if not thousands, of standing desks to choose from at any given online store. 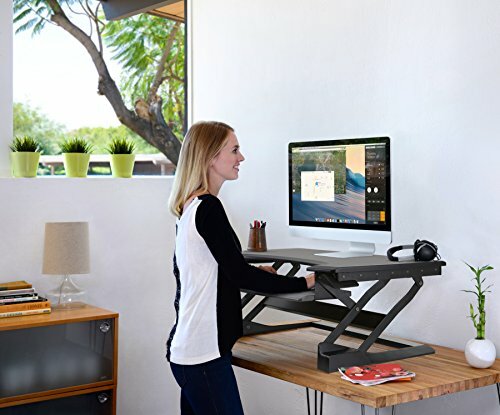 To help make it easy for you to find the perfect standing desk, allow us to present to you 11 of the best standing desks available on the market. No matter what your budget is, you’ll find a standing desk on this list that suits your needs and lifestyle. Two Tier Shelf System so monitor and keyboard are at correct working height. 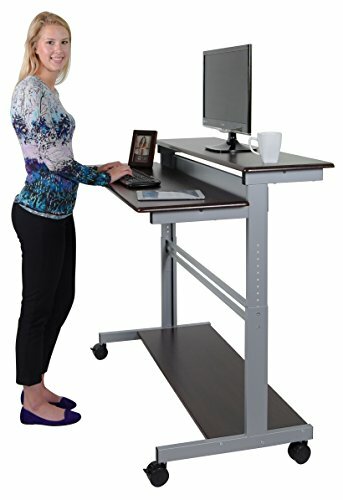 Whether you’re looking for your first standing desk or your 10th one, you can’t go wrong with the Mobile Ergonomic Stand Up Desk Computer Workstation. This standing desk packs in all the features you’d want at a low price. The main appeal about this standing desk is the two-tier shelving system for your monitor and keyboard. This unique two-tier shelf lets you place your monitor at the right height for your eyes while your keyboard is at the proper location for your wrists. The silver paint not only looks beautiful but will last for years without chipping or scratching. 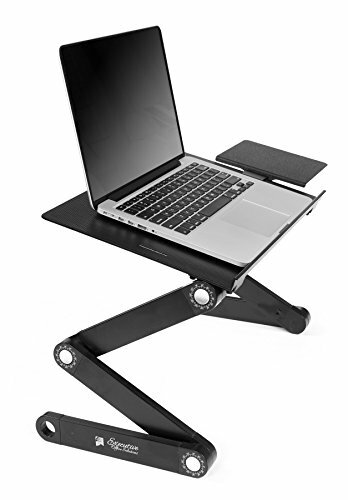 The wheels on the Mobile Ergonomic Stand Up Desk Computer Workstation make it easy to transport the desk to a new location while the locking brakes keep this standing desk in one spot. If you’re a designer who prefers the freedom and convenience a laptop provides, then you’ll love the Executive Office Solutions Adjustable Laptop Desk. This lightweight add-on lets you turn any desk into a standing desk. The adjustable legs rotate 360 degrees and lock at five different angles. This stand also includes CPU cooling fans that will help keep your laptop at a comfortable temperature even during times of heavy load. The LUXOR Standup-CF48-DW Stand Up Desk lets you transition from sitting to standing with ease. The crank on the side of the desks allows you to adjust the LUXOR Standup-CF48-DW Stand Up Desk up to a height of four feet. The durable steel frame can accommodate all of your technological gadgets while the rolling wheels allow you to move this desk from one room to another quickly. The desk also features an anti-scratch coating to ensure that it will last for years to come. The ErgotronHome Workspace Lift35 Adjustable Desk transitions from a regular desk to a standing desk in just a few quick seconds. Unlike other standing desks that use motors or cranks, the ErgotronHome Workspace Lift35 Adjustable Desk uses a counter-balance system to change its height quickly. This thick desk is incredibly stable, able to balance multiple monitors on it without sagging or cracking. You don’t need any tools to put this standing desk together or to make any adjustments to it. With the press of a button, you can adjust the height of the Canary Products Modern Electrical Height Adjustable Desk. The built-in motor extends this desk to a maximum of four feet while remaining so quiet you’ll wonder if the desk is even working. The addition of a crossbar to the desk gives it extra stability, letting the Canary Products Modern Electrical Height Adjustable Desk hold more weight than other standing desks. 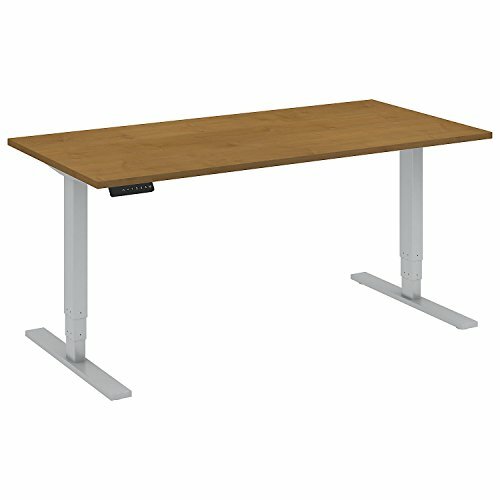 The Bush Business Furniture Height Adjustable Standing Desk is a beautiful desk, featuring a natural cherry finish and steel legs. This standing desk has some excellent features to go with its good looks. 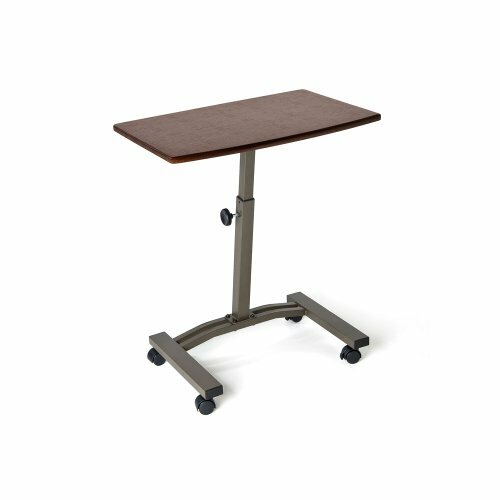 Some of the fantastic features you’ll find on this standing desk include a motor that increases and decreases the desk’s height, stain resistance and certification from both the ANSI and BIFMA organizations. The Bush Business Furniture Height Adjustable Standing Desk is perfect for multiple users, as it can store up to four height settings in its memory. 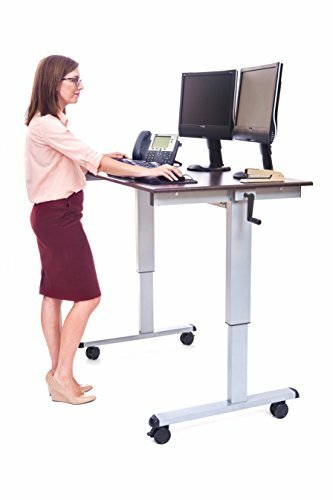 The FlexiSpot Wide Platform Height Adjustable Standing Desk Riser is an adjustable height add-on with all the features of an independent standing desk. This standalone desk offers two surfaces including a wide keyboard tray that accommodates large gaming keyboards. 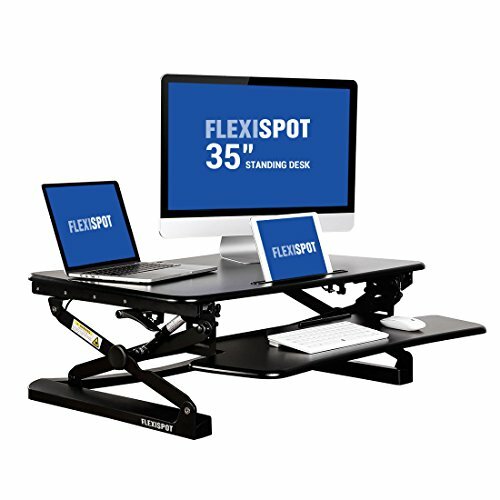 The FlexiSpot Wide Platform Height Adjustable Standing Desk Riser attaches to the top of any desk and can even extend outside for maximum comfort. This add-on is tiny but durable, supporting up to 35 pounds of weight. If you’re the type who prefers to alternate between sitting and standing, then you’ll love the Halter ED-600 Preassembled Height Adjustable Desk. By squeezing the handles on the side, you can easily reposition this standalone desk to a new height. The product arrives fully assembled, so all you have to do is take it out of the package to enjoy all the benefits of a standing desk. The small size and weight of the Halter ED-600 Preassembled Height Adjustable Desk ensures that this product can fit on almost any office desk or counter. 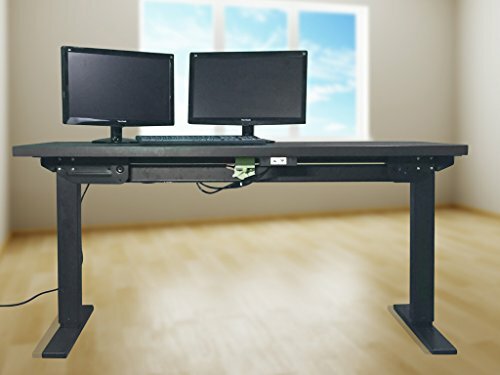 If you have a large gaming or office setup, then you need a large surface area like the one on the X-Elite Pro Height Adjustable Desk Converter. 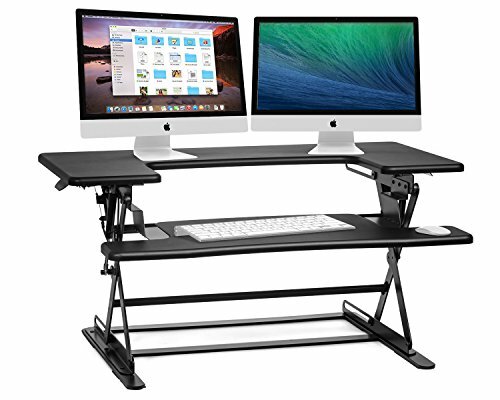 The massive surface area of the X-Elite Pro Height Adjustable Desk Converter means you have room for a monitor, keyboard and mouse with plenty of room to spare. The pump-assisted lift lets you adjust the height of this standing desk in just a few seconds. 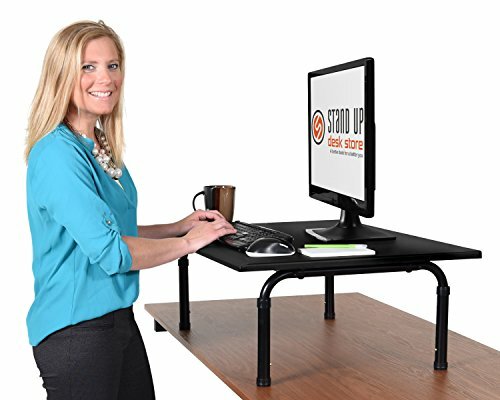 The Stand Up Desk Store Standing Desktop Desk proves that you don’t need a large budget to have an excellent standing desk. This budget standing desk has a wide 32-inch surface area, ensuring you have room for all of your equipment. This standing desk rests on top of any regular desk and features additional space underneath it for extra storage. The rubber feet on the Stand Up Desk Store Standing Desktop Desk make sure that this desk does not slip off any surface while you are using it. Adjusting this standing desk is a breeze thanks to the telescopic legs and the snap buttons. With laptops gaining in popularity over desktop computers, the Seville Classics Mobile Laptop Desk Cart is ideal for users who have embraced the laptop. The Seville Classics Mobile Laptop Desk Cart features rolling wheels, a telescoping leg to adjust the height and the ability to slant the desk to make it easier to type. The Seville Classics Mobile Laptop Desk Cart also includes a side table, giving you a perfect location to store drinks, books or a printer. Now that you know what health benefits a standing desk provides, you’re probably eager to run out and purchase the first one that you see. However, before purchasing any standing desk, you’re going to want to make sure it fits into the space you have picked out. A standing desk is not only taller than a regular desk but also slightly wider. A space that currently accommodates a regular desk could end up being too small for a standing desk, which is why taking accurate measurements is so important. First, you’ll want to measure how large the area is where you want to place your standing desk. These measurements will help you narrow down the available standing desks to just the ones that will fit into your space. It will also ensure you don’t buy a desk that is too big, requiring you to use up your valuable time to return or exchange it. Just a few minutes of measurements could save you hours of frustration. Next, measure yourself from head to toe. Don’t just rely on your driver’s license or memory; you’ll want an exact measurement of your current height. When measuring yourself, wear the shoes you’ll typically wear when using your standing desk if you’re planning on using this desk in an office environment. These measurements ensure you will purchase a standing desk that feels comfortable for your height and not one that is too small or big. After all, if you buy a standing desk that requires you to hunch over to use it or crane your neck upwards, you’re going to trade one set of joint pain for a different one. Finally, measure all the items you’ll place on your standing desk, such as your computer monitor, ergonomic keyboard and speakers. These measurements help ensure the surface area of your new standing desk is large enough to accommodate everything you plan on putting on it. Standing desks typically come in one of five different styles. Each of these styles has its own set of strengths and weaknesses. However, none of the five available options are better or worse than any other; rather, it’s going to come down to personal preference when choosing a particular style. The adjustable-height free-standing desks are the most common style for a standing desk. These desks resemble a standard desk except they are significantly taller to accommodate a user standing instead of sitting. True to its name, an adjustable-height free-standing desk allows you to adjust the height without moving everything off the desk. Typically, these desks are adjustable using electronic controls and a motor. These desks are perfect for families or offices where multiple individuals of varying height will share a single desk. Despite their name, the fixed-height standing desks don’t lock themselves into one particular height. However, to adjust the height on these desks requires the use of tools and for you to remove everything from the desk before adjusting it. What they lack in functionality, they make up for in style, with many fixed-height desks having elaborate designs. An adjustable-height desktop add-on lets you transform any regular desk into a standing desk. These extensions are compatible with nearly any desk and rest on the desk’s surface, with the keyboard and monitor resting on the extension. While these add-ons are cheap and allow you to try out a standing desk without a significant commitment, they are often ergonomically incorrect. As such, the adjustable-height desktop add-on is only suitable for short-term use. The fixed-height desktop risers are similar to the adjustable-height desktop add-ons but, instead of one platform, you receive adjustable risers of varying height. For example, you can place your monitor at eye level while you can place your keyboard at a smaller height. Despite their name, many fixed-height desktop risers do offer an adjustable height, but like the fixed-height standing desk, you’ll need an array of tools to increase or decrease the height. Lastly, there are the sit-stand-recline desks. These desks allow the user to sit and stand at will, even letting them lean all the way back into a horizontal position while using the computer. While this type of standing desk offers the most versatility, it has two major disadvantages: a high price and a significant amount of room. The sit-stand-recline desks can exceed values of $3,000, pricing them out of the range of most consumers. Unlike most consumer goods, the quality of a standing desk isn’t merely determined by price or brand name. An inexpensive desk is just as good as an expensive one if it meets your needs and even an unknown brand can deliver a high-quality standing desk. Instead, you’ll want to look at the features a particular standing desk offers when choosing one of your own. As mentioned previously in this buying guide, if multiple people are going to use your standing desk, opt for one with an easily adjustable height. If you’re the only person who will use the desk, a fixed-height desk is a good choice. 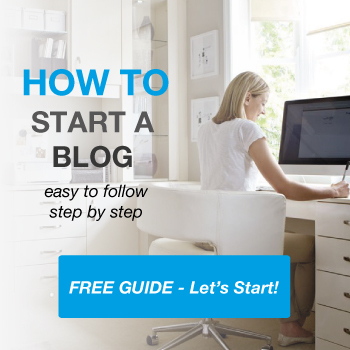 You’ll want to pay attention to the type of material utilized in the construction of the desk. While many standing desks use wood, you’ll want to examine the thickness of the wood and how sturdy it is. The last thing you’ll want is a desk that buckles under the weight of all of your equipment. Many standing desks have a maximum load value, so if you’re planning on placing a large amount of equipment on it, opt for a standing desk that can hold a significant amount of weight. In addition to ensuring your standing desk can hold your gear, you’ll also want to examine the surface area of the desk. Think in terms of the future when viewing the surface area; while a particular standing desk can hold your current items, you’ll want to make sure there is room to grow. For example, you may want to add a printer to your standing desk, or perhaps get a larger monitor in the future. A standing desk with a small surface area could significantly inhibit your capacity to expand your technology. If you’re planning on using your standing desk at home with children or you’re just clumsy, opt for a desk that uses rounded edges instead of the sharper edges found on your average desk. While a standing desk offers numerous health benefits, it’s not for everyone. Some users will never adjust to using a standing desk or may have previous injuries that make using a standing desk a torturous affair for extended periods of time. The best thing to do before spending the cash on any standing desk is to try it before you buy it. You can easily convert any regular desk into a temporary standing desk with just household items. For example, you can use a pile of books to give your monitor a height boost. While this is in no way ideal for long-term or even short-term use, creating a makeshift desk for a day will let you see if a standing desk is right for you. 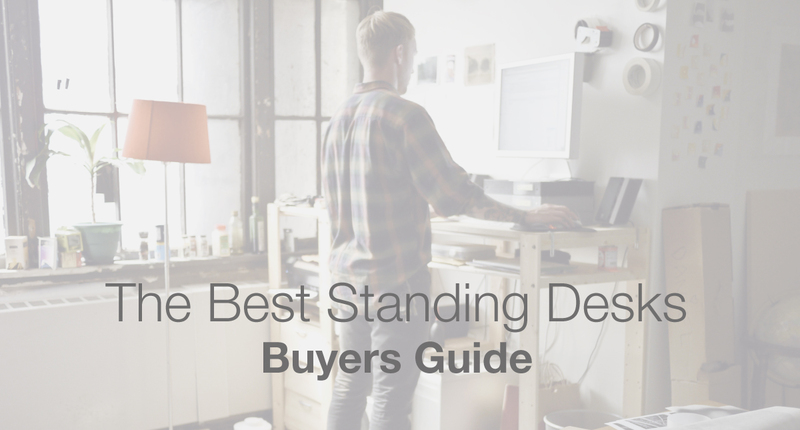 There are two different camps of standing desk enthusiasts: those that prefer to build a custom desk and those that prefer to buy a premade standing desk. Each side has its pros and cons. If you’re handy with a set of tools, have access to high-quality materials and want a personalized product, you’ll save a lot of cash building a standing desk. However, if you’re not quite so handy, the end result will be ugly at best and unstable at worst; in the worst-case scenario, your standing desk will fall apart, wrecking your equipment and the area around it. You could even cause injury to yourself as well! While you can add features to a DIY desk that you won’t find on retail standing desks, for the majority of consumers, it’s safer just to buy one. There is one accessory that is a must-own purchase to anyone buying a standing desk: a standing desk mat. A standing desk mat relieves the pressure on your soles, ankles and legs and allows you to stand for hours at a time with no pain or discomfort. While standing desk mats come in a variety of materials, if you’re looking for the best and most comfortable material possible, you’ll want a polyurethane standing desk mat. This high-quality material provides the best possible cushion for your feet, with foam and rubber materials coming in closely behind. A mess of unidentifiable cables usually rests under a typical desk that houses more than five different devices. Normally, this collection of cables is nothing more than an eyesore and a potential nuisance when you wrap your foot around a wire or two. However, with a standing desk, a giant mess of cables becomes less of a nuisance and more of a potential cause of injury. Since standing desks require much more walking than an average desk, each loose cable presents a new opportunity for you to either trip and fall or pull a monitor or keyboard onto the floor. Cable management becomes a top priority with a standing desk, and luckily, the solution only costs a few dollars. Most cable management sets are inexpensive and come with an array of clips of varying sizes that accommodate even the thickest cables. These cable management tools allow you can neatly bundle your cables together and place them out of a potential walkway. Hi Jamie, I enjoyed your post. If you are going to use a portable standing desk, it is important that you get your screen up to eye level so you don’t get a bad neck. A good example of this is ZestDesk.com. Just an idea for any updates you make. Have a great day!